Have you ever stopped to wonder what drives the incessant innovation in processed food? Who thought that an energy bar would be a good thing to exist? What was the logic that drove the development of the cheese-flavoured powder that coats so many snacks? Even instant coffee; why was that needed? The answer to all these questions, and many more, can be traced back to the US Army’s Natick Center, outside Boston, Massachusetts. That is where the Combat Feeding Directorate of the US army, with the help of academics and large food processing companies, designs the rations that sustain American soldiers and much of the rest of America and the world. Soldiers need rations that are lightweight, that don’t spoil over time, and that can withstand some pretty brutal handling. The rest of us pay for the same. 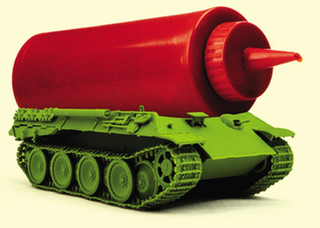 Author Anastacia Marx de Selcado’s book Combat-Ready Kitchen, published in early August, lifts the lid on how the army has invaded almost all aspects of processed food. Combat-Ready Kitchen is available from Amazon and elsewhere. If you buy from that link, I get a tiny pittance. Anastacia Marx de Selcado has a website, of course. The banner photograph shows a high pressure processing production line, © Moira Mac.